Can’t find the sound to finish off your next hit??? Well, now you are in the right place to find a creative resource for your anthem!!! “ProZone series feat. 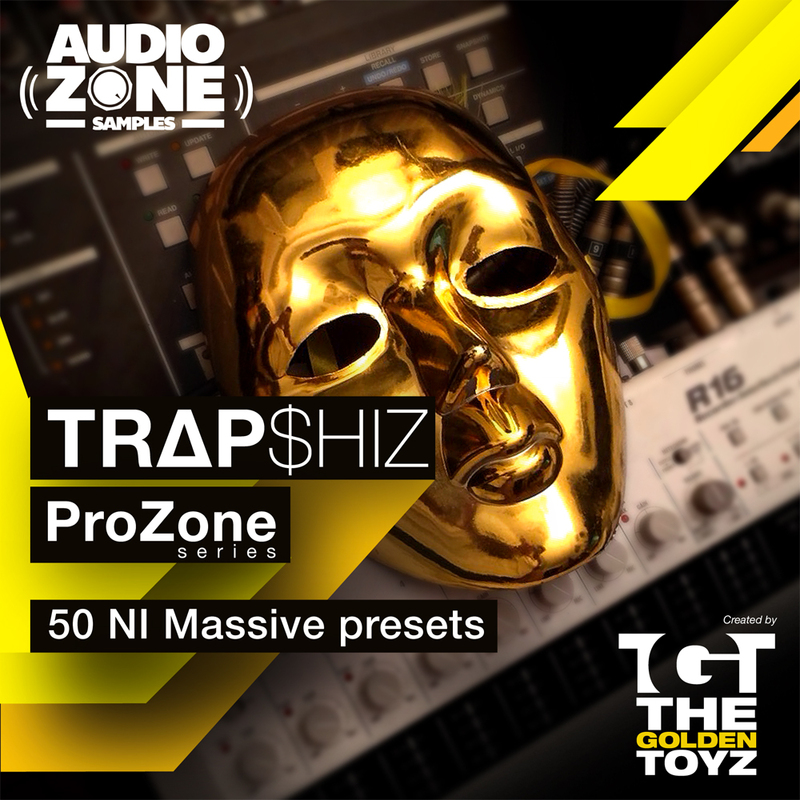 The Golden Toyz – TrapShiz for Massive” includes 50 extraordinary NI Massive’s presets dedicated for producers who are looking to create and perform their own booty shakin’ tracks! The ProZone Series are brought to you by Audiozone Samples, and are back with 50 unique Trap & Twerk sounds designed to assault the dancefloor!!! This pack contains monstrous Subs and unbelievable Basses, fat Leads and other powerful sounds, ideal for any fresh genre including Trap, Dubstep, EDM, D&B, Twerk & Hip Hop. Macro controls are assigned, Randomizing and Velocity control is assigned to many different presets, and the sounds have been crafted to be as full, punchy, hooky and dirty as possible. Every preset have been carefully adjusted for the best playability, with smooth envelopes, with smooth attacks and releases, so you can edit and manipulate the sounds when you need! All this sounds are ready to add a special flavour and improve your track with many musical possibilities you may not have heard before!!! This release have been created by The Golden Toyz, a Dj, Producer & Sound Engineer who is one of the top notch Italian Trap’s artist. His track “Favelas” feat. Aquadrop was re-edited by RL GRIME and has reached 2 millions of views on SoundCloud. Actually TGT is working with Doner Music, one of the best label in Trap, Hip Hop, Grime and Dubstep in Italy. So if Trap is your genre and NI Massive is your synth, this is the right collection to produce your next track!!! AUDIOZONE SAMPLES, the Future Sound of Tomorrow! Please Note: requires NI Massive 1.3 or above.